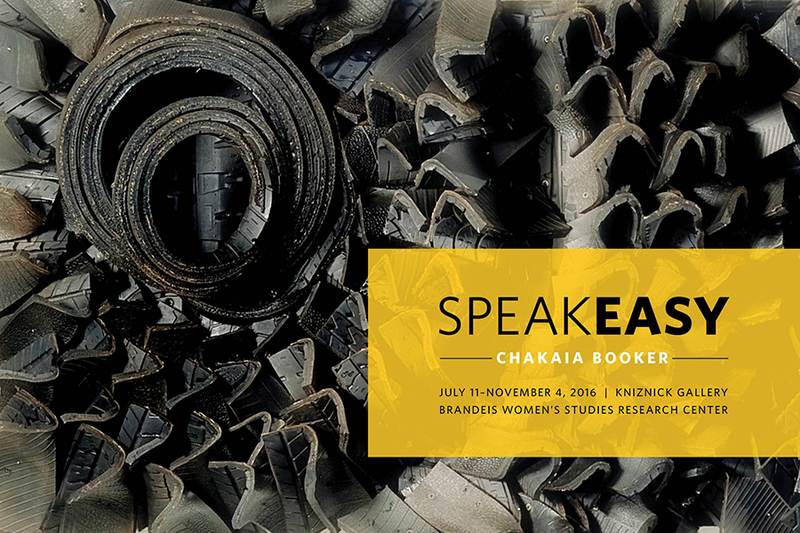 Chakaia Booker’s abstract sculptures made from automobile tires address cultural, gender, and environmental issues through their physicality and suggestive forms. Booker’s work is often monumental in scale, and she achieves a range of effects with the pliable material. The forms and textures she creates fluctuate from industrial and supernatural to expansive and figurative. Discarded rubber tires come with immediate associations of excess and colossal waste, but as sculptural material their characteristics take on new meaning. The skin-like membranes with worn treads and patterned, burnt surfaces are exploited by the artist. Her prints in the exhibition demonstrate a similar responsiveness to her process and materials and expand her visual language in 2 dimensions. She marks the woodblock surfaces with drills, chisels, and routers, mimicking her sculptural practice. With the printed material, she arranges torn and layered shapes to create figurative and abstract forms. Booker’s intention is to create an open dialogue with the viewer, allowing the final form of her work to evade a singular reading. SpeakEasy refers to elusive territory, obscured potential and the surprising consequences of the artist’s manipulation of materials.